You're coming to party for 24-hours on January 18th? Partying is one of the greatest activities known to man, and doing it for 24 consecutive hours in St. Louis is hard to beat. If you are coming into St. Louis on Friday, January 17, you may want to sleep at some point before heading to our 24-hour party spot on Saturday the 18th. First, rack your brain and see if you or your friends know anyone that lives in St. Louis (People that do not play bike polo.). If it is possible for you to find housing with someone outside of the polo community in or near St. Louis, that would be a huge help. The St. Louis club is not gigantic, so housing the entire Lock-In crowd with people from our club is a big ask. That is not to say it is impossible for our club to house all of you on Friday night, but if your first action could be exploring the option of staying with someone in St. Louis that is not associated with our club, that would be helpful. Second, if finding housing in St. Louis on your own is impossible, we would be happy to be as accommodating as possible. 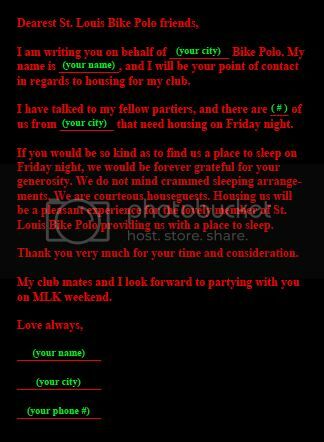 To secure housing with a member of St. Louis Bike Polo, we need you to talk to everyone in your club that is attending the Lock-In and figure out how many of you need housing. Then one person from your group should contact us and politely provide us with where you are from and how many people from your city you need us to house. This should be a simple task. Communicate with your club mates, and then send us a single, polite and concise email. Of course, sleep is not required, and if you want to party nonstop from Friday night until Sunday afternoon, we fully support that endeavor (we even have suggestions on places to party long after everyone has called it a night). The Super Lock-In Experience...A full weekend of nonstop partying! Go for it! We believe in you!